Humility gets a bad rap. Too many of us associate being humble with weakness, insecurity, and unlikability. Humility is a virtue that goes hand in hand with trust–which is what we have been talking about on the podcast recently. If we reject the idea of becoming more humble, then we’re not trusting that God is going to provide for us. The Litany of Humility is a tough prayer to pray, but I have committed to praying it daily for 2019. Will you join me? Bookmark it here. 2. Take the worst job. This is advice from St. Mother Teresa years ago. Do you avoid certain jobs? Do you consider certain tasks “beneath you”? When divvying up jobs among family or coworkers or others, make it a habit to volunteer for the worst one. When you notice something good about someone else or some way in which they are blessed, give them a compliment! Be generous in your words and actions with others. Be open to other ideas and perspectives. Don’t assume you know everything already. There is much we can learn if we make an effort to truly listen to what others have to say. No great thing is ever done in a vacuum. We can do nothing without the help of God’s grace, but also our family, our friends, and our coworkers are likely parts of our successes and achievements. When you receive a compliment or an honor, look for ways to share the credit! Do you avoid asking for or accepting help, even when you really need it? Recognize this bad habit as your stubborn pride and share your struggles with other people in your life. I also share some feedback from listener Ann Marie who shares her goals for 2019 and a touching story about the Litany of Trust we have been praying this year. I also share some ideas from Kristen and Kate who offer a couple resources listed below. 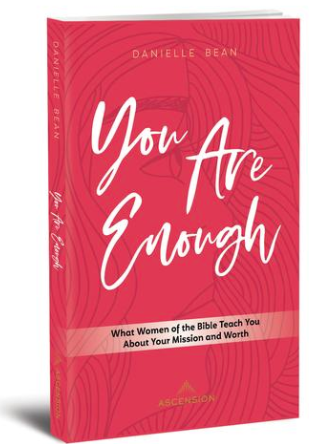 My new book, You Are Enough: What Women of the Bible Teach You About Your Mission and Worth, is available! Get ten percent off by using the code, GIRLFRIENDS. My retreat, based off the themes in You Are Enough, has also launched! Get all the information here! The You’re Worth It! Retreat for Women. Find out more about bringing this unique event for women to your parish, group, or community. Find out more about having me come speak at your parish or conference.